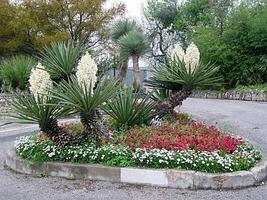 Yuccas are New World plants in the family Agavaceae and are an important genus in terms of ornamental landscaping usage as well as of an economic importance in some areas of its range. 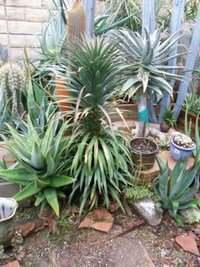 This is an Agave-like plant that, in general, has more cold tolerance than most Agaves, though there are some cold intolerant species (and a few fairly cold tolerant Agaves as well). 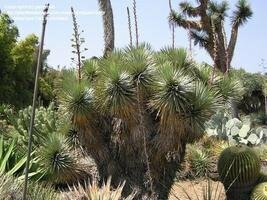 These are arid-loving, rosette-shaped flowering plants that consist of primarily lanceolate leaf blades with very sharp leaf tips. 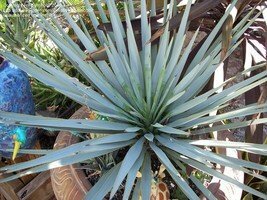 Some Agaves and Yuccas are hard to tell apart, though Agave and Yucca flowers look very different. 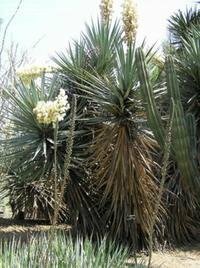 Most Yuccas are stemmed plants, but quite a few are not. 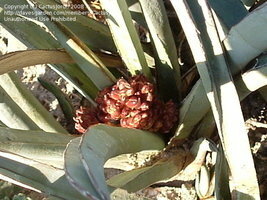 Most Yuccas flower repeatedly, but a few are monocarpic (flower once, and then die) like most of the Agaves. 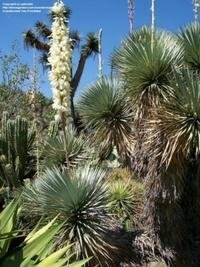 The flowers of Yuccas are generally large and showy, are white or pale yellow (some exceptions) and are pollinated by moths that are only attracted to Yucca flowers (this makes propagation by seed in my yard difficult as these moths are probably not in large numbers in urban landscapes). 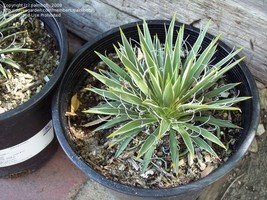 Without any exceptions I am aware of Yuccas are full sun plants (some survive in shadier locales, but would probably prefer full sun) and I have lost a number of Yuccas from too little sunlight. 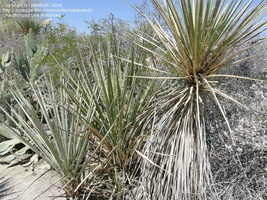 These plants also seem to love high, dry heat, though some cultivars are not in this group. 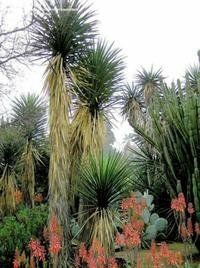 Some Yuccas excel in humid climates, but most prefer a dry climate. 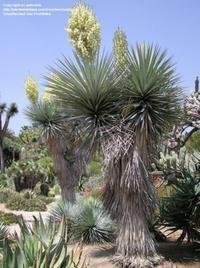 Though some Yuccas are not cold tolerant, few Yuccas are too tropical in their needs to survive in most areas of Southern California. Some species tolerate USDA zones as low as 4 (-30F or -34C) while others have problems in zones below 9b (25F or -4C). 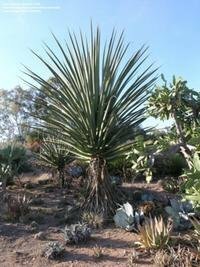 This an excellent species for low rainfall and/or high wind zones where so many other plants struggle. 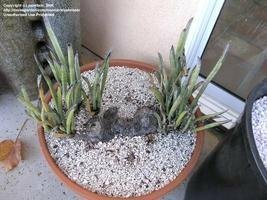 Though most prefer well draining soils, many obviously tolerate clayey, poorly draining soils as well. 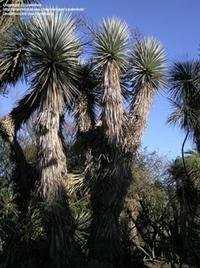 Yuccas are a plant that, as a child, I had no love for. 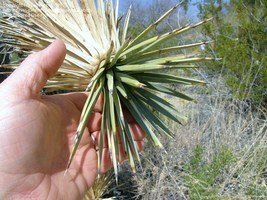 Hiking through the valleys, deserts and mesas of New Mexico, I was often careless enough to be jabbed by the local Yucca species. Tthey were everywhere and were not--to me--an overly ornamental species. 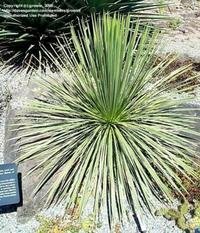 The name Yucca brings to mind a low, shrubby pale green dangerous array of pointed spines I had to constantly avoid. 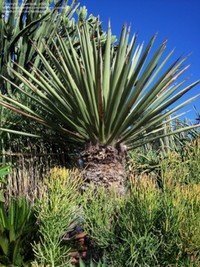 But I have since learned some Yuccas are indeed beautiful plants and definitely worthy of desertscape potential, as well as useful for outdoor pots and planters. 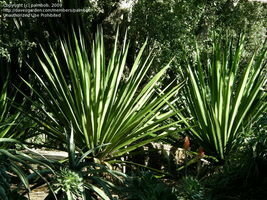 Yucca aloifolia (Spanish Bayonet, Dagger Plant) This is a U.S. native but also grows in Mexico and the West Indies. 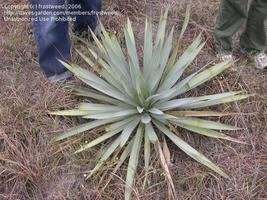 Yucca aloifolia is a thicket-forming plant with very sharp, stiff, rough-surfaced leaf blades, with the old leaves browning, pointing down and drying plastered against the stems in a long petticoat of dead leaves. 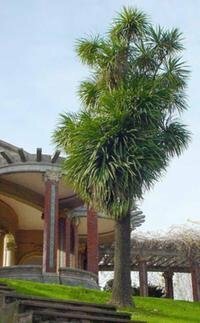 Stems are up to twenty feet high, though most tall plants eventually topple and grow laterally for a while before growing upright again. 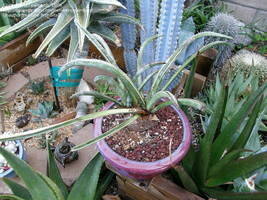 The variegated forms are far more popular in cultivation than the normal green forms. 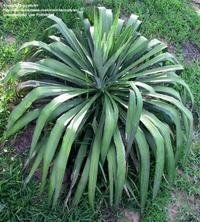 This is a zone 8 to 11 plant. For more, see this Floridata webpage. 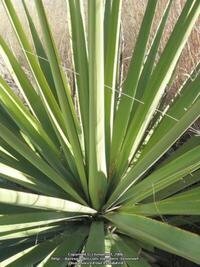 Yucca baccata (Banana or Datil Yucca) This is a native of the U.S. Southwest and Mexico, where is relatively common. 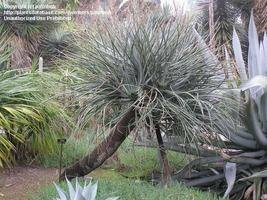 It is also used fairly commonly as an accent plant, but rarely as a specimen plant (only older, stemmed plants have remarkable specimen potential). 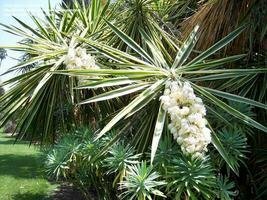 It is one of the wider-leaved Yuccas and has ornamental pendulous whitish flowers that only very vaguely resemble bananas. 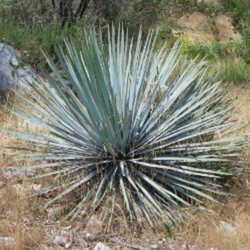 Most have dull green leaves, but some forms have bluish leaves. 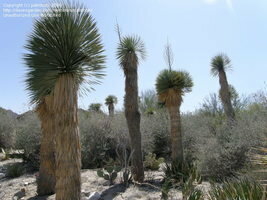 It is a very cold hardy species surviving in USDA zone 5 (-20F or -29C) or possibly even colder. 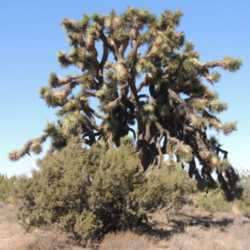 Yucca brevifolia (Joshua Tree) This southwest native literally grows in forests in some areas of California and are one of the classic symbols of the California desert (it is to the California desert as the Saguaro Cactus is to the Arizona desert). 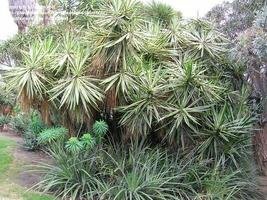 This is probably the largest of the North American Yuccas growing up to fifty feet or more (usually topping out around thirty feet). 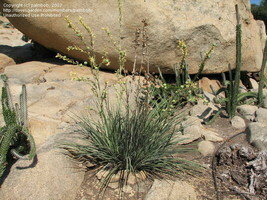 It is a stiff, short, pale to lime-green leaved species with a wonderful randomly branching habit. 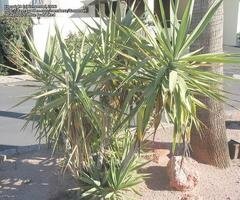 Plants are extremely drought and heat tolerant but require excellent drainage and a lot of direct sun. It is hardy to -10F or -23C. Variety jaegeriana seems to be a somewhat smaller version, but how exactly it differs is unclear. 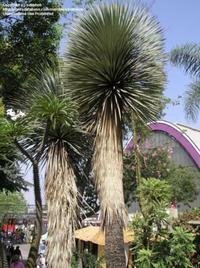 Yucca decipiens (Palma China) This is a rare species in cultivation, originating from Mexico, and is very similar to Yucca filifera in shape and habit. 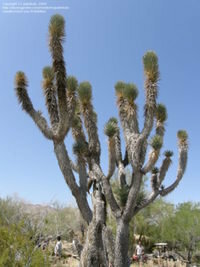 It develops a massively wide base over time and eventually branches. Leaves are stiff and dangerously sharp. 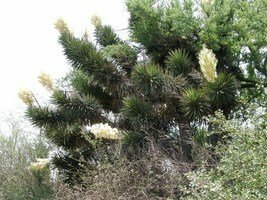 Flowers are upright rather than pendulous, though, and that is about the only way I can tell this one from Yucca filifera. 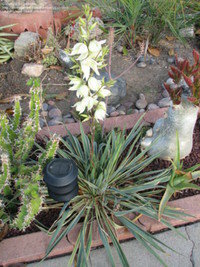 Cold hardiness is to about 15F or -9C. 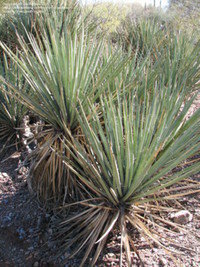 Yucca desmetiana. 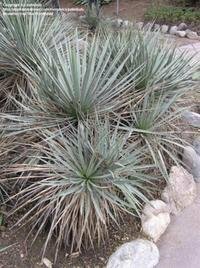 This is not a common species of Yucca in cultivation, and it is unknown (as far as I know) in the wild, making it a likely hybrid, though between what and what I have no idea (this species looks like no other Yuccas). 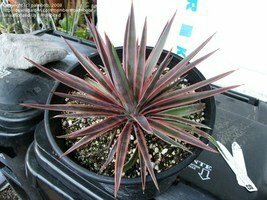 It is a non-branching, rubbery-leaved plant with blue-green, short harmless arching leaves that turn a nice burgundy color in winters. It is not very cold hardy having trouble with temperatures below 25F or -4C. 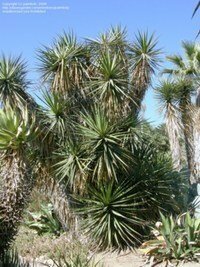 Yucca elata (Soaptree Yucca) This southwest U.S. and Mexican native is one of my favorite species for landscape use. 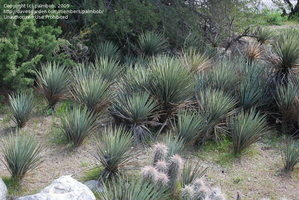 It is a short tree Yucca with a reliable branching habit with multiple heads of thin, pale green leaves with distinctive fibers along their margins. 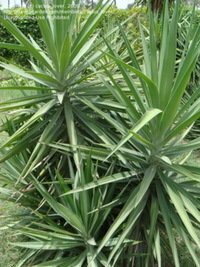 The leaves have sharp tips but are fairly flexible and not terribly dangerous (watch your eyes, though). It has cold hardiness down to about zone 6a (-10F or -23C). 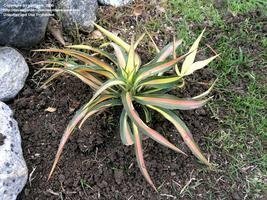 This plant needs very well draining soil and full sun. 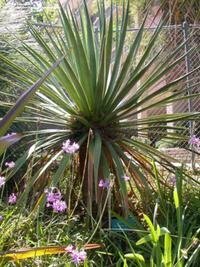 Yucca endlichiana. 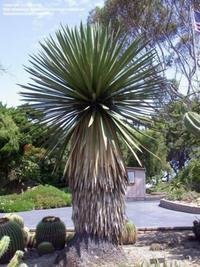 This is sort of an oddball Mexican species and one of my favorite Yuccas in my garden. 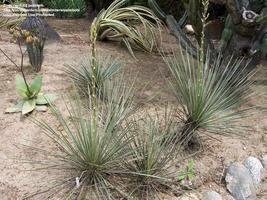 It is a very slow-growing species with turquoise, stiff curved, grooved leaves that arise off a caudiciform base. 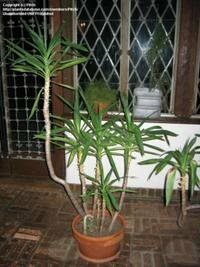 Though not a great landscape plant except in small, open gardens, it makes a good, though peculiar, potted plant. 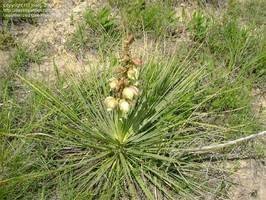 Flowers are also very un-Yucca like being a bright red-orange. It is cold hardy only down to about 25F or -4C. 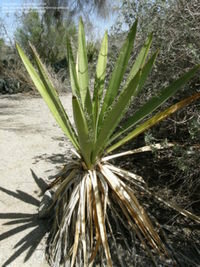 Yucca faxoniana (syn. 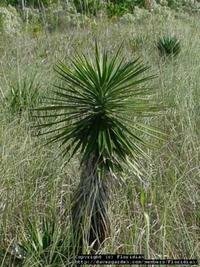 Yucca carnerosana; Eve's Needle or Giant Spanish Dagger) This Texas/Mexcian species is probably one of the most dangerous Yuccas having very long, rigid and very sharp deep green leaves. 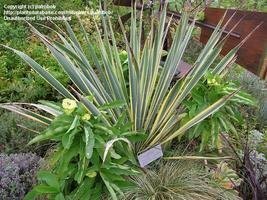 It is an excellent and highly ornamental landscape plant however and deserves to be grown more often in areas where it can be given more room. 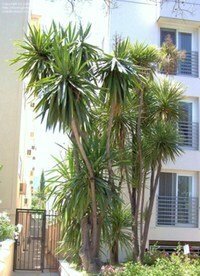 This is a single stemmed Yucca up to 15 feet tall. Cold hardiness is about to zone 8a (10F or -12C). 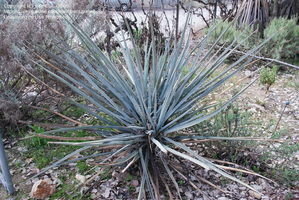 Yucca filamentosa (Adam's Needle, Bear Grass or Spoonleaf Yucca) This is another U.S. native (southeast) and is one of the most cold hardy of all the Yuccas. 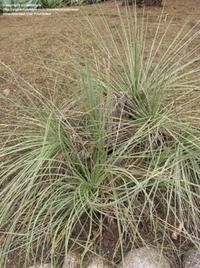 This stemless plant has relatively soft, thin leaves that often bend under their own weight. 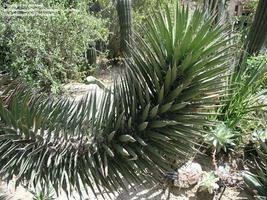 There is still a sharp tip and the end, but it is not a very dangerous plant as Yuccas go. 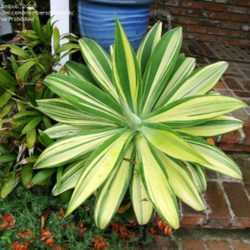 There are many cultivars of this plant, most variegations and far more popular in cultivation than the normal green form. For more information see this Floridata webpage. 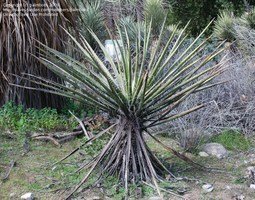 Yucca filifera (Tree Yucca or Peter-pan Palm) This Mexican species has to be the biggest of all the Yuccas growing as tall as fifty feet with massive bases 15 feet wide or more (like a Yucca brevifolia on steroids). 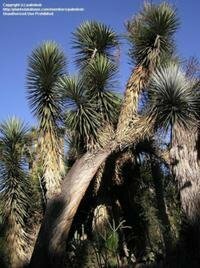 Leaves are a deep, dull green and much longer and wider than those of Yucca brevifolia. Despite its amazing landscape potential, it is not (yet) a very popular species. It is relatively cold sensitive only surviving temperatures down to about 10F or -12C (zone 8b). 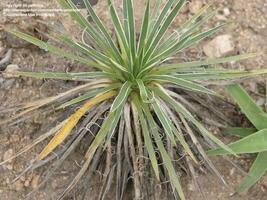 Yucca glauca (Soap Weed, Bear Grass or Great Plains Yucca) This small, stemless or short-stemmed, wispy to spiny plant is a cold hardy native of the Midwestern U.S., and was one of the banes of my youthful hiking experiences (along with Yucca harrimaniae and a variety of Opuntia spp.). 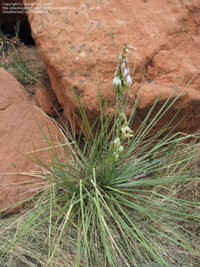 This is the semi-official state flower of New Mexico (along with Yucca elata, since no species was specified in the Yucca's becoming of the state flower Some varieties are somewhat soft and have relatively harmless leaves while others have dagger-like, stiff and incredibly sharp blades. 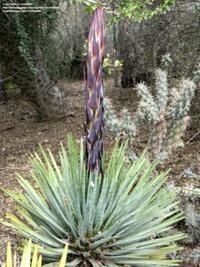 This is probably the hardiest of the Yuccas, growing happily in the snow-covered Rocky Mountains where temperatures dip down to -30F or -34C. Yucca gloriosa (Spanish Dagger, Palm Lily or Mound-Lily Yucca) This southeast U.S. native is another popular species in cultivation (both variegated and non-variegated forms) as it forms relatively short mounds (up to eight feet tall, but usually shorter) of densely leaved globes of rough-surfaced, wide leave blades. The tips are sharp but not very dangerously so. 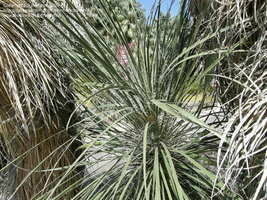 This is a USDA zone 7 to 11 plant and another species that is very tolerant of soil varieties and light availability. However, it does best in full sun and sandy, well draining soils. For more information, see this Floridata webpage. 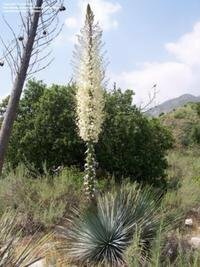 Yucca grandiflora (Large Flowered Yucca) A tall, suckering Mexican species, this is another relatively uncommon plant in cultivation, partly because it takes up a lot of room and has a lot less adaptable nature compared to the somewhat similar species, Yucca guatamalensis (see below). Leaves are straight, not floppy, and end in a sharp spine. 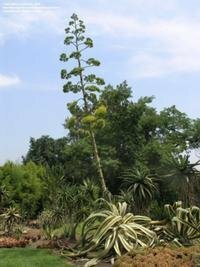 Plants grow as tall as 30 feet, and can grow nearly as wide eventually. Hardiness is down to about zone 9a (20F or -7C). 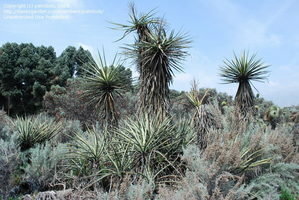 Yucca guatemalensis (syn. 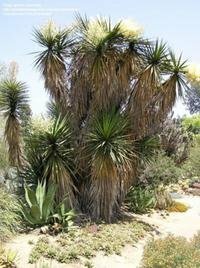 Y. elephantipes; Spineless, Blue-Stem or Giant Yucca) This Central American Yucca is the most commonly grown Yucca in Southern California where it is virtually ubiquitous in most urban and rural areas as popular landscape trees. 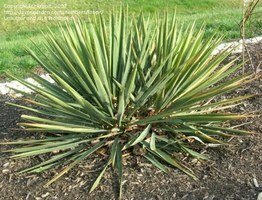 Though not very cold tolerant, it is at least one of the most versatile Yuccas in warmer climates tolerating a wide variety of soil types, sun exposures and humidity (will grow well in humid climates, as well as being quite drought tolerant). 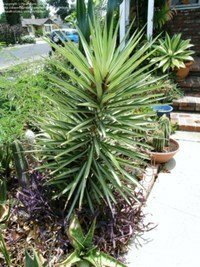 It is even useful as a house plant and rivals some of the Cordylines and Dracaenas as one of the most commonly grown palm-like house plants in the U.S. Large plants can grow up to thirty feet and have massive bases with dozens of stems. 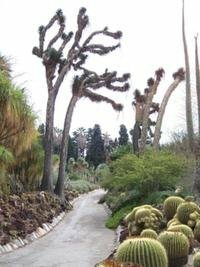 It is a variable species, at least now in cultivation where many plants are possibly hybrids with something else. It has long, rubbery leave blades with only mildly sharp tips. 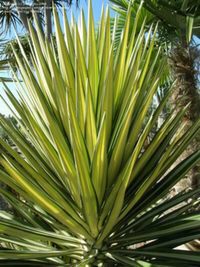 A variegated form is sometimes seen. 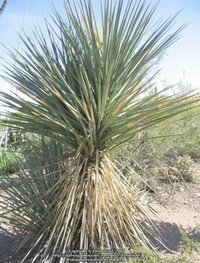 Yucca harrimaniae (Spanish Bayonet or New Mexico Yucca) Even more than Yucca glauca, this plant was an annoying presence in my years growing up in New Mexico, constantly poking through my pants, shoes and socks as I hiked about the countryside. 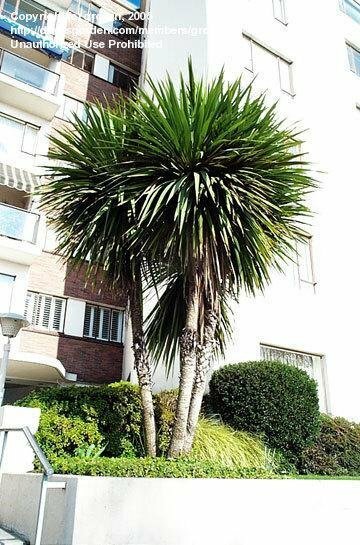 My neighbor's sister lost an eye to this plant. But now that I have more of an appreciation for sharp and dangerous things, I find it at least somewhat ornamental. 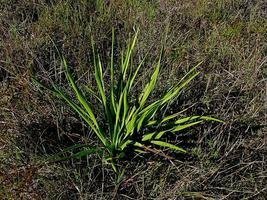 It is a stemless, neat, compact species about 2 feet tall and wide. 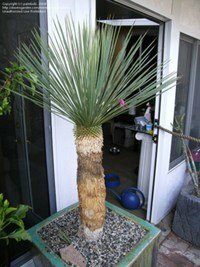 It is extremely drought-tolerant and survives temperatures down to about -20F or -30C, but seems somewhat intolerant of climates that stay too warm, making it a hard plant to keep alive in my southern California climate. 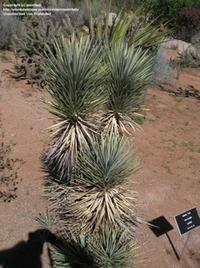 Yucca nana (Dwarf Yucca) still uncommon in cultivation, this Utah native is one of the smallest Yuccas only growing about six to eight inches tall and wide. 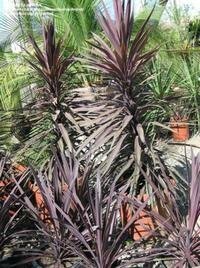 It has a neat habit, though, and makes a nice potted plant or accent for smaller landscape areas. 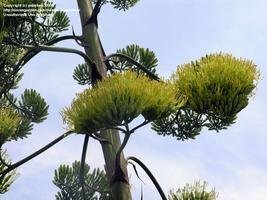 I sometime have a hard time telling this from a few species of Agave, though their flowers look nothing alike. It is cold hardy down to about -20F or -29C. Yucca recurvifolia (Curve-leaf or Pendulous Yucca) This Southeast U.S. native is one of the popular Yuccas in cultivation since it is common, relatively ‘safe' and comes in a variety of tropical looking cultivars. 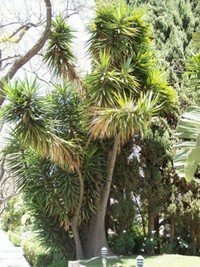 This plant eventually forms a short unbranched (usually) trunk up to six feet. Hardiness is about 0F or -18C. 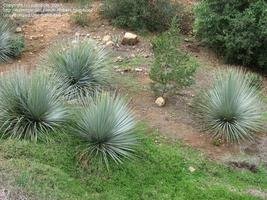 Yucca rigida (Blue or Silver-leaf Yucca) This Mexican species is one of the most beautiful of all the stemmed Yuccas having very stiff, sharp pale blue to blue-green leaves. 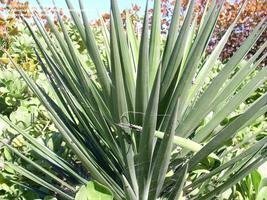 Sometimes confused with Yucca rostrata, one can easily tell the difference up close by feeling the leaf blades- very stiff ending in an extremely sharp tip. 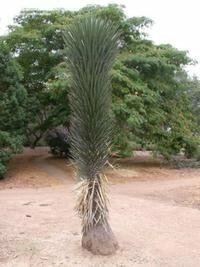 This plant grows up to over ten feet and can either have many heads or just one to two. 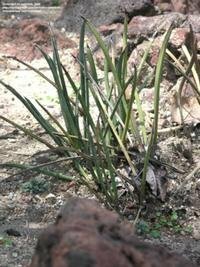 This species does not tolerate low light situations well and will usually start growing abnormally short, stunted leaves in shade. 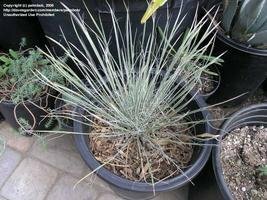 It is cold tolerant to about zone 7b (5F or -15C). 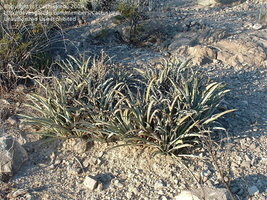 Yucca rostrata (Beaked Yucca) This is a Texan and Mexican native that is well known for its ornamental appearance. 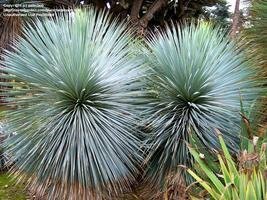 It is one of the most popular specimen Yuccas in Southern California thanks to the striking blue sphere of flat, subtly variegated leaves. 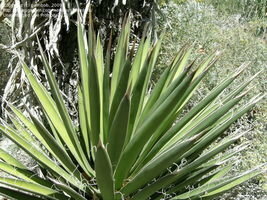 Though the leaves have sharp tips, they are flexible and not one of the more dangerous Yuccas. 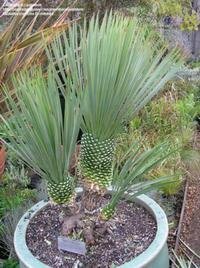 Yucca rostrata is an easy species to grow with minimal care (as are most Yuccas) and can remain in a pot for many years, growing up to ten feet tall or more. 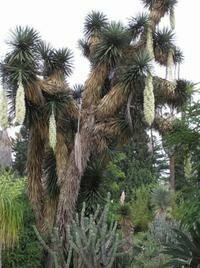 Most plants seem to remain solitary, but some branch after flowering creating a fantastic two to three headed beauty. This is pretty cold tolerant plant surviving zone 5b (-15F or -26C). For more information, see this webpage. Yucca schidigera (Mojave Yucca) Native to the deserts of Southern California along with several other southwestern states and Baja California, this common, medium-stemmed (up to 15 feet tall eventually) Yucca is one of the least-used Yuccas in landscaping, partly due to its dagger-like leaves but also because of its somewhat unkempt and less-than-ornamental appeal. Despite this lack of landscape use, it is one of the more used species in herbal medicines. 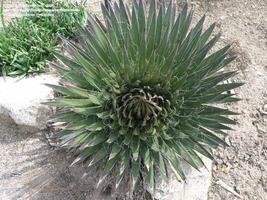 This plant is cold hardy down to about 20F or -7C. 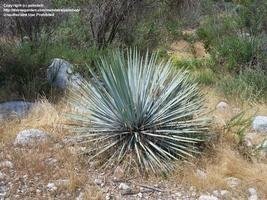 Yucca schottii (Mountain Yucca) This Southwest U.S. native is a short-stemmed Yucca (it can grow up to 20 feet tall eventually, though) with very stiff and straight leaves. 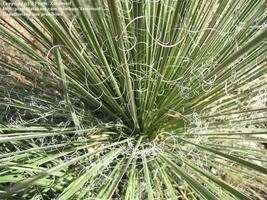 Though it is used in landscaping in some southwestern climates, it is not one of the more ornamental of the Yuccas having a relatively sparse head of leaves. 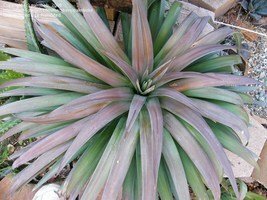 It is a natural hybrid between Yucca baccata and Yucca elata. Cold hardiness is fairly good, down to -10F or -23C. 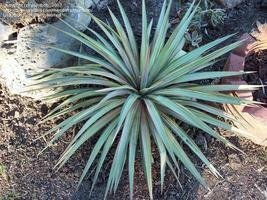 Yucca thompsoniana (Thompson's Yucca or Beaked Yucca) This Texan native can sometimes be confused with Yucca rostrata having a densely leaved globe of pale bluish to blue-green leaves. 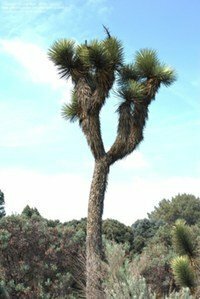 However this species has slightly stiffer, rougher leaves and is a reliable branch-former growing into small, ornamental trees about eight to ten feet tall and up to ten branches. 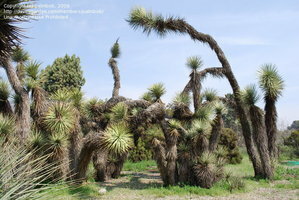 Older plants can look a bit like the smaller form of Yucca brevifolia, but the branches are shorter and crowns bluer. 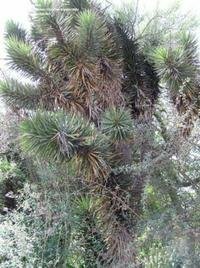 This plant is cold hardy down to about 5F or -15C. 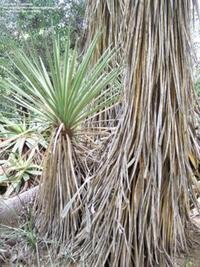 Yucca valida (Datilillo) though not currently a very common landscape species in the U.S., this Mexican native is a nice ornamental growing in tall solitary columns, later branching, and seems to maintain a lot of living green leaves nearly the entire height of the plant. 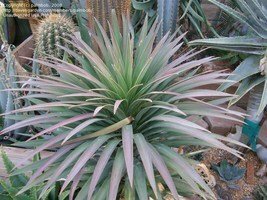 These leaves are relatively short, stout, stiff and ‘agave-like', ending in a very sharp thorn. 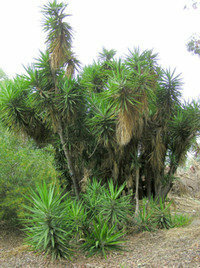 It is one of the less hardy Yuccas surviving only down to zone 9a (20F or -6C). Yucca whipplei (aka Hesperoyucca; Chaparral Yucca or Our Lord's Candle) This is a native from Baja California and is one of the few monocarpic Yuccas. 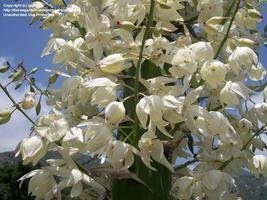 However, it goes out with a bang, producing a huge panicle up to 20 feet tall. 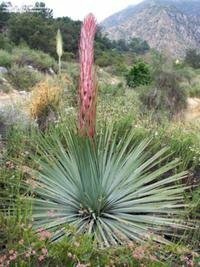 The flower begins as a brilliant red spike which is in striking contrast to the bright turquoise to pale green leaves. 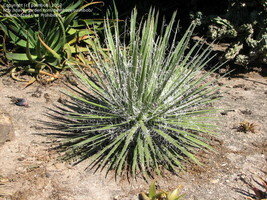 This a stemless species with particularly spiny, stiff leaves so it is not a good landscape plant near foot traffic. Cold hardiness is down to about 10F or -23C. 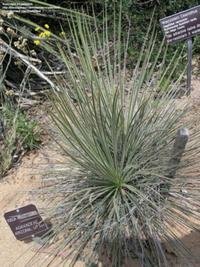 Recently some have put this in its own genus, Hesperoyucca. 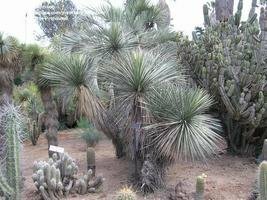 For a more complete coverage on Yuccas, you can view the Yucca listings in PlantFiles or visit this website which is dedicated entirely to Yuccas.